Swinging its way to an Oscar for best animated feature in 2018, Spider-man: Into the Spider-Verse marks the latest film featuring everyone’s favourite arachnid superhero. Or should that be superheroes? In a Marvel-world stuffed to the rafters with characters, plot-lines and more sequels than you can shake a stick at this award-winner takes a slightly different approach to the conventional story of Peter Parker. Built out of a punchline from an episode of US sitcom The Unbreakable Kimmy Schmidt, the film makes a feature out of spider-man’s pile-up of continuities that began with Stan Lee way back in 1962 and has seen the character appear in television series in both the US and Japan in the 1970s and unrelated film franchises across the 1990s, 2000s and 2010s. 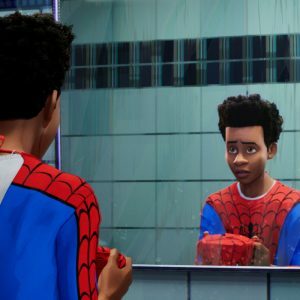 This outing starts in an expressionistically animated New York that conjures images of the original comics, where we are introduced to our first spider-person, the teenager Miles Morales. In Miles’s world his nemesis, the rectangle-shaped Kingpin, opens up a rift in the multi-verse with a volatile technology that allows timelines to interweave and a host of other spider-people to crawl onto screen… Peter Parker makes an appearance (it would be rude if he didn’t), but so does Nick Cage playing Spider-Man Noir (oh yes), an anthropomorphic pig called Spider-Ham (hmm) and an anime arachno-droid SP//dr (ok, given the others we’ll roll with that). This spider-cast (there’s actually six of them in total) moves with their own animated style – a nice touch – and they must combine their powers to defeat Kingpin and a web of second-string villains from the spidery gallery of rogues. Spider-Man: Into the Spider-Verse comes to the room above Herne Hill Station on 28 May at 7:00PM, and although it’s a half-term event aimed at younger cinema-goes, like all animations these days, it ticks the boxes for adults equally well. But if you’re an older audience member we must warn you that if you come in fancy dress you might get a few funny looks.